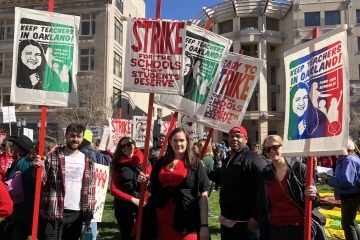 As a member of the California Calls alliance, we along with the California League of Women Voters and Reverend Ben McBride from PICO California filed The Schools and Local Communities Funding Act of 2018 – a November 2018 ballot initiative to restore over $11 Billion annually to California’s schools, community colleges and local services. It will require those commercial property owners who have profited from Prop 13’s tax inequities to finally pay their fair share. The initiative is backed by a powerful coalition of 45 organizations, a growing list of over 250 local and state endorsers, 1,000s of grassroots leaders that have been tirelessly working on this issue for years, and 100,0000s of voters who have pledged support for this needed reform. “The Republican tax heist will soon devastate working and middle-income families, especially in low-income communities of color. They are handing over billions in tax cuts to multinational corporations and the wealthy elite, and will pay off the resulting $1.5 trillion deficit by dismantling Medicare, safety net programs and Social Security. Trump’s agenda – the corporate tax giveaway, racist immigration policies, the dismantling of the Affordable Care Act, turning back the clock on criminal justice reform, the elimination of workplace and environmental protections — is a direct attack on our communities,” says Anthony Thigpenn, President of California Calls. “We need a bold and courageous response to this assault. As California leads the resistance, we must also fight proactively for the future we deserve – the best schools, health care for all, safe neighborhoods, justice and opportunity for all Californians. 1. Endorse the California Schools and Local Communities Funding Act. 2. Collect signatures to help us qualify for the November 2018 ballot. Beginning in late February, we will begin circulating petitions to submit nearly 1 million signatures by May. Please contact damita@oaklandrisingaction.org to join us in this effort. 3. Contribute financially to our campaign. Our opposition will be fierce and well-funded. We can’t match them dollar for dollar, but we know we will need major resources to get our message out to millions of voters, and counter the distortions and lies we know the opposition will use to against us. This year we have seen unprecedented exercising of political power in Alabama, New Jersey, Virginia, and Wisconsin. 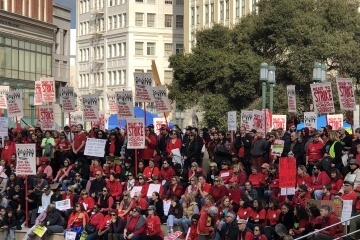 We want California and Oakland to speak equally loudly in standing up to the continued attacks and unchecked corporate greed, and assert an agenda based on the values of equity, justice, and inclusion. Now is the time for courage and bold Action. With out Actions together, Oakland is Rising! 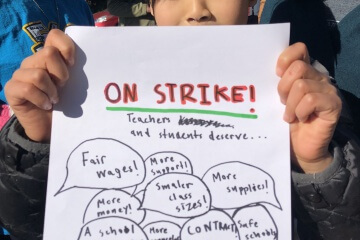 The Fight for School Resources Continues!